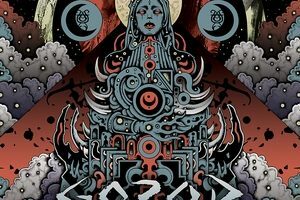 Never a band to rest on their laurels, Gorod has been continually trying to up the ante and switch things around when it comes to their tech death style. From groovy to fast and super-technical, they are a band not keen on repeating themselves. They are also willing to explore the boundaries a bit too, with experimental EPs such as Transcendence and Kiss the Freak, in which they incorporated acoustic and thrashy approaches, respectively. This brings us up to their new album, Aethra, in which melody plays a larger role. Designed to be an experiment in spontaneity, Aethra was recorded in a purposely quick time span. Without time to overanalyze things, the band explores more groovy and sometimes melodic/melancholic areas that have not been as big a part of their sound previously. But with some decidedly Gorod infusions of complex musicianship of course. 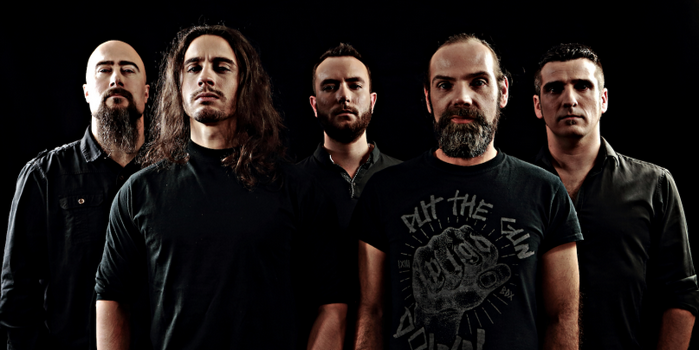 We had a chat with vocalist Julien ‘Nutz’ Deyres before the album’s release to get his perspective on the release, along with how the band has changed over the years, and even the connection between classical, jazz, and metal. Dead Rhetoric: How do you feel that Gorod has stepped up in writing Aethra? Julien Deyres: I’m really super excited about this record and it’s one of my favorite records I’ve been involved in. The results are pretty great – we were able to experience a bit more than we are used to. The album was made extremely fast. From the first riff to the end of the vocal tracking, it only lasted 4 months. We didn’t have the time to overthink the details. Spontaneity was the word. In the end, when you didn’t have the time to think, you just tried more things and in the end I would say it’s one of our most varied albums. Dead Rhetoric: Could you talk about the concept behind Aethra? Deyres: I was asked by the other members to try to find something that could relate to anyone. I’m actually a tour guide, so I am very knowledgeable about art history and things like that. I was in a museum and was looking at an exhibition by the painter Paul Gauguin in Paris, and I saw a picture of the goddess of the moon, Hina. So I thought about making a concept about the moon. I think that anyone on Earth has a personal history with the moon, through ages and time. Dead Rhetoric: What do you like about focusing on a concept for each record? Deyres: It’s hard work, because you have to find something that can link with all of the songs. You are also imposing yourself with something that’s super annoying at the start, but at the end it’s nice because you are focusing on one specific topic and have a whole history to it. You are drowning yourself in one thing. It’s a lot of work but it’s logical to work in the end. It’s a more direct writing process and feels like more of a university writing exercise [laughs]. There’s a real composition and poetic exercise to it. I do enjoy it because I used to be a student and it reminds me of doing that sort of work. For the listener, it’s also nice because you are plunging into this whole world to listen to. Dead Rhetoric: You mentioned that you are a tour guide. So do you go around and showcase art? Deyres: I’ve studied art history and have a master’s degree in painting around the 1900s in Europe, specifically the Czech Republic. Then I decided to get a diploma to be a tour guide, because I have always loved traveling. I enjoy traveling, going to museums, and telling stories. If you are a tour guide, you are telling stories to tourists. I’ve been doing it for a couple of years now. I specialize in my region, the southwest of France, so if anyone is coming here, I can show them monuments, churches, city halls, and any architectural details of anything that links to the older history to now. Dead Rhetoric: So do you see doing concept albums as a different type of storytelling? Deyres: Exactly, yes. That’s what I was looking at with the topic of the moon. We have a thousand gods or goddesses that exist, and you have to choose them to make a story. Some of them are more storytelling, and some of them are descriptive/photographic/artistic. It depends on the mood of the music. In the end, I always try to find a topic after listening to the whole song. I never start working before the album is entirely composed. The music is leading everything. I try to focus on passages and find ones that are perfect for a particular emotion. It’s really important to adapt the words to the music. At first, I’m a guitar player so I am a music composer, so the music remains the first thing. I’m not a novelist or real writer, I’m more connected with music and the spiritual art than an intellectual one. Dead Rhetoric: What did Daniel Bergstand and Lawrence Mackrory bring out with the mixing/mastering? Deyres: Mathieu [Pascal] is the main composer, but he’s also running his own studio, and he has been for years and years. He’s not used to letting other people do it instead of him, but it was a wish from the rest of the band – to finally have another point of view on our music. When you are mixing yourself from beginning to end, you are completely drowning in it. We wanted to take a step back from it. It was my personal choice to have Daniel Bergstand because he is one of my favorite producers. Behemoth’s Demigod is one of my favorite [recording] sounds that I like. But it was hard, because we had to let it go. We were not sure if they would notice every detail, and it was challenging for Mathieu to let someone else work instead of him. In the end, I’m super satisfied with the end result. I think they did an awesome job, and it was all long distance because we never met before face-to-face. Dead Rhetoric: You’ve moved around through a few labels at this point. What brought you to Overpowered Records? Deyres: We actually didn’t have that many offers for the new album, because everything has changed so much. Labels now want something that is 100% complete, with the music and artwork has to be ready. When you have nothing new to propose it’s impossible. We went with Overpowered Records because we felt they would spend more time with us than a huge label that doesn’t have time to care for a smaller extreme band, which would rather focus on the more mainstream stuff that they have. Dead Rhetoric: With the technical complexity in the music that Gorod has, what do you view the role of the vocals as within the whole? Deyres: That’s a hard thing, because the music sounds very technical but it isn’t quite as complex as it seems, because this is the way that Mathieu is making music. He’s really connected with psychedelic rock and jazz from the ‘70s. Things that don’t sound technical, but they are. In the end, we are not composing songs, so vocals are the slave of the music. I have to adapt to any tone and atmosphere – that’s the hardest part of it. As I mentioned before, I’m a guitar player, so I see the music not only as a vocalist. I just want to make a part that fits with the music. That’s my main goal to be honest. It’s not too hard, if I understand the music I discuss it with Mathieu and we try it directly. On this last album, we didn’t have much time at all. I just wrote a few things and looked to see how I could make it fit. It’s a sort of game that we are playing, because it has to fit with the music. Dead Rhetoric: Gorod has released both acoustic and thrash EPs in the past. What drew you towards going outside the death metal boundaries? Deyres: Because we know more now as musicians and we just love playing music and performing live. These were opportunities to do some things we normally didn’t do with [Gorod]. It was an experiment and it was to have fun. We make the music for ourselves and our pleasure, and we love a lot of acoustic music. Transcendence was a chance to experiment, even if we never played this sort of music live. But the thrash EP was a funny adventure. We wanted to see if we could do something like that. We don’t question ourselves, we just do it. We want to prove that we are remaining free as musicians. This is the purpose of those EPs. They are 100% DIY, we just press it and sell it as a show, but we have 100% freedom. Dead Rhetoric: I wanted to circle back to cover art. With your background, do you view the cover as being a particularly important piece? Deyres: It has to be, definitely. This time I wanted to work with a friend of ours who is a painter [Jeff Grimal], and he used to play in The Great Old Ones, and our bassist also plays in that band. So we have been working as a family this time. I really love his artwork, and we have a lot in common in our tastes. I have known him for a couple of years and when we talk about exhibitions and artists, we like similar things. As an art lover, it’s very important [cover art] and it’s not always easy because the problem is that I am not alone – we are a band. We are a community, and everyone has to agree. Everything is a discussion, because it’s not one person deciding everything for everyone. This time, we wanted to work with [Grimal], who is also a moon-lover, like so many people on Earth [laughs], and I think he did a really good job. Dead Rhetoric: You came into the band in 2010. How do you see the band as changing since that time? Deyres: It’s changed a lot, and the line-up has been changing as well. I’ve known Mathieu since before I joined the band, because were in similar areas and I was in another band. We recorded in his studio, so I was first a fan of the band. It was different for sure, because there was a different drummer – there was a woman [Sandrine Bourguignon] on drums who was more into groovy stuff than blasting, and when she was replaced by Sam [Santiago], the band completely changed. They became faster and more technical as opposed to groovy, old school death metal. Now we are trying to make a link between both sides of the band, when it was more groovy, and Karol [Diers], our new drummer, he changes a lot of aspects of the band. We are going back to older roots, the really groovy ones, but we still have a lot of the fast stuff with blasting. The only thing we added on this album was a slightly darker, more melancholic atmosphere that has not been in Gorod before. 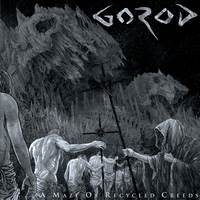 Gorod has always been sort of happy death metal [laughs], at least compared to the rest of the tech death scene. But we are trying to make a link to the older, super groovy part and make a mix of everything the band has experienced. It’s not a total change, but a retrospective with some new stuff. Dead Rhetoric: I view Gorod as one of the larger and more important bands of the tech death scene. What do you see as the strengths of the band’s approach to the genre? Deyres: The problem, to be honest, is that we aren’t pure tech death listeners. We listen to a lot of different things. Nowadays I listen to more hip hop, electro music, and classical stuff. When I am listening to technical stuff, I really enjoy the super noisy stuff. The band Daughters is one of my favorite bands. The very early stuff from The Dillinger Escape Plan, early Converge – that’s my scene. Mathieu doesn’t listen to much metal at all. He’s more connected to jazz and the old technical rock from the ‘70s. What we enjoyed has changed us from some of the other bands, because we are not looking for speed or super technical things, we are just trying to make songs. It’s not our purpose to be the fastest or craziest. We are starting to become old people [laughs]. We come from an older scene and now the younger generation is going so far and so crazy with things. It’s not our purpose anymore, we just give it to them, because they do it so well. We are just trying to do something faithful to what we do. The groove remains some of the main stuff for us. Dead Rhetoric: What do you look at as the connection between jazz, classical, and metal? Deyres: They are so connected. Classical is the most connected. The last show I saw was a classical concert [laughs]. I was with a friend who is also a metalhead, and we used to have a band together, and we heard a progression we thought it was so brutal! It’s so connected. If you listen to “The Rite of Spring” by Igor Stravinsky, there are so many parts that can sound like Immolation or Suffocation – you just need to add a brutal blast. The only difference is that in classical music there is no chorus, it just starts at the beginning and ends. In jazz, the manner of playing the instrument and technique [is similar]. In my opinion, classical music is similar in the way of composition, and jazz is more connected with the pure technique. When you put it all together, with the rock stuff adding choruses and simple structure, then you have death metal. It’s as simple as that! Dead Rhetoric: What plans do you have once the album releases? Deyres: The next tour is in November in Europe with Beyond Creation, who are friends with us, along with Entheos and Brought by Pain. My main purpose now is to work on a US tour for 2019. We have gotten a few offers but there’s nothing final yet. We really want to reach the US in April or May at the latest and we hope to join a tour or create one with other tech death bands. We have friends there, with bands like Archspire – we would be so glad to tour with them. But we are not the only ones who make the decisions. But in 2019 we have to be in the US [laughs]. That’s all I can say!